Comic Con stories at Techdirt. stories filed under: "comic con"
We were just talking about the odd ruling that came down in which the court overseeing the trademark dispute between the San Diego Comic-Con and the former Salt Lake Comic Con somehow awarded $4 million in attorney's fees, despite the jury award for trademark infringement amounting only to $20k. In addition to the award of attorney's fees, Judge Battaglia also issued an injunction barring the Salt Lake show from calling itself any variation of the term "comic con" but, oddly, refused to issue a similar injunction barring it from calling itself a "comic convention." As we noted at the time, it's plainly absurd that the "vention" difference there is doing that much heavy lifting in the court's mind. But the reverberations of the ruling are now being felt throughout the country, with one company that puts on many comic conventions doing sweeping name changes for many of its shows. Tampa Bay Comic Con has changed its name to Tampa Bay Comic Convention. The change comes less than two weeks after a federal judge in California ordered organizers of Salt Lake Comic Con to pay nearly $4 million in attorneys’ fees and costs to San Diego Comic Convention in a trademark infringement suit. He can decline to comment on that all he wants, but it's pretty plain what is going on here. Those putting on other comic conventions throughout the country have been keeping a watchful eye on the fight between SLCC and SDCC. With this enormous award of attorney's fees after such a paltry judgement, convention organizers are simply doing the math and realizing that even if they convince a jury that its infringement isn't willful in the future, they can still get slammed with attorney's fees. They also likely know that after the ruling on the injunction that prevents SLCC from using any variation of the "comic con" term, the SDCC is surely coming for them next. And, so, they unilaterally disarm. It's at this point that I will insist again on pointing out how absurd every last bit of this is. To allow "comic con" to be a trademarkable term, but to admit that "comic convention" is not because of its descriptive nature, is so silly as to make one's head hurt. For millions of dollars to be exchanged because of the difference between those two terms, all on the pretense that the public is somehow confused as to whether the SDCC is in charge of all of these conventions, is crazy-pants. For the result of all of this to be tens or hundreds of other conventions proactively changing their generic names to slightly more generic names is downright infuriating. In the wake of San Diego Comic-Con winning its years-long lawsuit against Salt Lake Comicon over its trademark on the term "comic-con", much of the media coverage was somewhat apocalyptic as to what the consequences would be for cons across the country. Despite the payout for winning the suit being a paltry $20k, more focus was put on just how other cons would react. The early returns are mixed, with some proactively undergoing name-changes to avoid litigation and others staying stalwart. The point we have made all along is that this win for SDCC was not some ultimate final act on the matter. And, as many predicted, it appears that win wasn't even the final act with regards to its SLCC foe, as the Utah-based con has filed for a new trial. The Salt Lake lawyers say evidence was wrongly excluded during trial and improper jury instructions undercut the evidence. It will be very interesting to see where this goes, because many of us that observed the goings on of the initial trial were surprised at its outcome. From a trademark perspective, the arguments for genericide raised by SLCC seemed quite obvious. The evidence of genericide is present in every bit of follow up coverage one sees dealing with how many other shows with some version of "comic con" in their names are either changing those names or standing firm and continuing to use them. The phrase is everywhere in the industry, which only makes sense, given that the phrase is essentially nothing more than a description of the type of show being conducted. Part of the issue raised in the filing for a new trial appears to be how much the jury was allowed to hear about other cons using the term nationwide. Part of the excluded evidence was testimony about the use of “comic con” by third-party competitors, which could make the term generic, the motion says. In addition, according to the motion, the trial judge gave a defective instruction that said competitive use is inadequate to establish genericness. It's easy to see how such misguided instructions and barring of relevant evidence would give rise to such an erroneous verdict. Regardless, it seems likely that there will be more to come in round two of the wrath of cons. We had just been talking about the brewing trademark civil war set to break out across the country in the comics conventions space, with Yakima Central City Comic Con choosing not to react to the fiasco of a court case that saw San Diego Comic-Con enforce its trademark against a convention in Salt Lake City. Their decision, publicly revealed relatively soon after the court case outcome, indicated that some comic conventions take the view that SDCC's trademark is invalid for any number of reasons and that they can simply wait for the Salt Lake Comic Con's attempt to invalidate SDCC's trademark to shake out. These would be conventions deciding not to freak out just because one bully got one win. But of course that stance could never be universal among all comic conventions in America and now we have our first convention deciding to show everyone what a chilling effect trademark bullying can have. The previously-named Phoenix Comicon has announced it will be rebranding as the Phoenix Comic Fest, with the company behind the convention, Square Egg Entertainment, providing only the thinnest of veils over its reasoning for the change. Square Egg also said that they will change the event’s website and other assets over the next week to reflect the new name. As of this writing, they’ve already updated the event's Facebookand Twitter accounts and have posted an updated logo for the event. This, necessarily, must be considered a win for the San Diego Comic-Con folks. The whole point of the lawsuit that kicked all of this off was that they didn't want anyone else using their plainly generic and descriptive, yet now enforced, trademark. Still, the obvious question is exactly what sort of win is this? If anything, this move by the now-named Phoenix Comic Fest seems to indicate that even the fearful out there will simply rebrand. With no actual customer or public confusion to seriously be worried about, it seems to me that the only real incentive in all of this for SDCC is licensing and partnership agreements. A simple name change does away with those potential rewards. Still, it's worth keeping in mind that there are over 100 conventions in America alone using some flavor of the "comic con" mark. What percentage will undertake the very real costs in rebranding and what percentage will stand their ground carries some importance, but so long as the latter number is sizable SDCC will have quite a bit in the way of court costs and lawyers' fees to pay for the pleasure of eking out five-figure jury awards. After following the saga of what seemed like a truly misguided lawsuit brought by the San Diego Comic-Con against the company putting on the Salt Lake ComiCon, the whole thing culminated in the SDCC getting a win in the courtroom. One of the reasons this verdict threw many, including this writer, for a loop is that the defendant in the case made the argument that the SDCC had allowed the term "comic con" to become generic, an argument buttressed by the reality of there being roughly a zillion comic conventions using the term across America. Despite the SLCC's public discussions about appealing the decision and the fact that proceedings are already underway to cancel the SDCC's trademark entirely, much of the media speculation centered around what those zillion other conventions would do in reaction to the verdict. It was a question that seemingly made sense, but the actual reaction by at least some conventions should have been plainly predictable. And, indeed, now there are some conventions willing to come out and publicly say they aren't going to change a damned thing based on this one verdict. Yakima’s Central City Comic Con will hold off on a name change after one of the nation’s largest comic conventions won a trademark lawsuit. Yakima’s comic convention started in 2015, and is one of more than 100 conventions that uses “Comic Con” in their names. Rose City, of course, wouldn't need to change its name as it somewhat infamously and more conveniently decided to partner with the San Diego Comic-Con in the middle of the whole trademark trial, but the larger point remains. The war was not the trademark trial. That was merely the opening battle. To win this war, that the SDCC decided to start for no conceivable reason, it will need to pepper the country with lawsuits against a hundred or so comic conventions, hopefully winning more than it loses and hopefully getting more than $20k a pop, which is what it earned from the three-year campaign against SLCC. All the while, mind you, it must also hope its "comic-con" trademark isn't suddenly cancelled out from underneath it by a USPTO that might finally realize the term is both generic and descriptive. That's quite a hill to climb and must look more like Waterloo than Normandy. We've been following the trademark dispute between the Salt Lake Comic Con and the San Diego Comic-Con for some time now, including all of its strange ups and downs. Despite this whole dispute starting something like three years ago, the trial itself has kept a brisk pace, with SLCC already resting its defense and jury deliberations beginning this week as well. While we'll have to wait for the jury's decision, the trial has gone pretty much as we expected. SDCC rolled out its trademark registration that it appears to have forgotten it ever had until recently from an enforcement perspective, along with some commissioned surveys suggesting that the public views the word "comic-con" as a brand and not a generic term. SLCC has pointed out that there are a ton of other comic cons out there, few of which have any licensing agreement with SDCC, and SLCC had expert witnesses poke some glaring holes in the SDCC's survey. Andrew Baker, associate professor of marketing at San Diego State University, reviewed the survey for Salt Lake Comic Con and testified Wednesday that the results are flawed. Because of risks he saw of "good participant bias," and because the online survey didn't include a way to weed out unreliable responses from people who may have attempted to fill out the survey for money, Baker criticized the results as inconclusive. "This study cannot be relied upon to tell us the percentage of people who think comic con is a brand," Baker testified. Bryan Brandenburg, one of the partners behind SLCC, took the stand to recount the process by which they came up with the name Salt Lake Comic Con. As you'd expect, he recounted searching around for other similar conventions, noting that nearly all of them were using the "comic con" phrase, or some variant of it, and concluding that this is just what those types of shows are called. It's an understandable position, particularly given the descriptive nature of the phrase. A "comic con" is a "comic convention." Simple. One would hope the jury would understand that simple fact. But there was some minor drama in the courtroom surrounding SLCC's desire to speak out about the case on its social media platforms, specifically to do with Brandenburg's testimony and the defense he would offer. The post announced that Brandenburg would take the witness stand to show that "comic con is owned by the people, by all the fans that experience the joy and celebration of comic con in cities all over the world." Battaglia prohibited such arguments in the trial based on objections raised beforehand by San Diego. He warned that if Brandenburg intended to make any such statements during his testimony, "tell him to bring his toothbrush with him." Notably, Brandenburg did not raise that defense on the stand, so His Honor was not forced to put him in jail. But this wasn't the only remark Judge Battaglia made on the subject. He expanded upon it in a way that shows him bristling with the striking down of his earlier gag order on SLCC from speaking at all about the case. "The circuit seems to believe people can say whatever they want in the world and in the media, but they don't get that privilege in my courtroom," Battaglia noted Wednesday. Well, okay then. While I've cheered on SLCC discussing the case in public for the benefit of that public, and while we were quite critical of Battaglia's gag order, the freedom to speak is not without its dangers. It's a little surprising that SLCC would be so cavalier with its public comments on social media sites that run directly contrary to the orders of a judge who had already tried to slap it with a gag order. That's just silly and a sign that, whatever happens moving forward, SLCC should probably get its PR house in order. Regardless, the jury is in deliberations and you can be sure we'll be commenting on the results they bring back. Our regular readers will know that we've been covering the years-long trademark lawsuit between the famous San Diego Comic-Con and the Salt Lake ComicCon since the very beginning. The whole thing has been something of a saga, with the SDCC issuing various threats and filing a lawsuit, while the SLCC has managed to fumble its way through court, getting slapped around for attempting various counter-logical defenses and even getting a gag order on it temporarily, unconstitutionally barring it from talking about the case publicly. Well, the court heard opening statements in the case this past week, with the SDCC trotting out the same studies it had presented during the pre-trial motions. Callie Bjurstrom, attorney for San Diego Comic-Con told jurors that Salt Lake Comic Con hijacked the Comic-Con trademark. That it “remained a small, intimate comic convention for decades” and that it wasn’t until the early 2000s that “the secret was out: Comics were cool and Comic-Con was the place to be to catch what was hot and what was next”. And as hundreds of similar conventions sprang up in cities across the country, Salt Lake Comic Con tried to “hijack” the trademark, to “steal the Comic-Con brand” saying “You don’t need to use ‘Comic-Con’ in your name to identify your comic and popular-arts convention… Convention is a generic term. Comic-Con is a brand” and that Salt Lake Comic Con is duping consumers into believing their events are associated, especially when they parked an Audi convertible near the San Diego Convention Center during the 2014 show, wrapped with promotions for the Salt Lake event. Of course, the problem with this study is that no matter what the public in the SDCC's sample indicated, the simple fact is that comic conventions throughout the country have been using the term "comic con" with wild abandon. As they did so, it seems that the SDCC was in some sort of trademark hibernation for years, with no action against all of these national comic cons that I can find. SLCC made the same point in its opening argument, their defense seemingly settling on the notion that the term "comic con" had become generic. Attorneys for the Salt Lake Comic Con and Dan Farr Productions said the phrase has become generic, part of the public commons, and therefore unprotectable. Michael Katz with Maschoff Brennan said that “Comic Con” is a generic term used to refer to a type of convention and that the show “looked to the industry” in naming their convention in 2013. “They used the same formula: Salt Lake to refer to where they were, and Comic Con to refer to what they were”. That Comic Con was a “national brand” and there could be no confusion between the one in San Diego and the one in Utah, which he called a “flyover state”, and that theirs was a “homegrown” event where four out of five attendees came from Utah, and it was so specific to the state that it didn’t run on Sundays because of Utah’s large religious population. And that “I don’t think we’re here because of large numbers of people confusing San Diego Comic-Con with Salt Lake Comic Con. … They have not been harmed by little Salt Lake. They have not lost a single customer to us. We are small potatoes”. It seems that the SDCC fully anticipated this defense and decided to attempt to undermine it by finding a comic con out there, any comic con, to enter into a laughably cheap licensing agreement. That SDCC is doing this only at the same time it is bringing this suit to trial makes its motive plain and naked. It's a shameless attempt to give its long-abandoned trademark the imprimatur of now having an actual licensee. As disappointing as the SDCC's actions are, those of the sellout cons are all the more so. Just read the press release from Rose City Comic Con in Portland about how it licensed the "comic con" mark and you'll get an idea of just how likely it is that the SDCC basically scripted this thing for them. So moist does Rose City seem to be over its free license that it must have failed to understand the motive for this free gift by the SDCC and the damage it might do to all of the other comic cons out there that are now or might in the future be under threat by SDCC. Now, I don't believe that SDCC managing to squeeze a few licensees from this national barrel of turnips suddenly means that it didn't long ago abandon the "comic con" mark, but it seems obvious that these sorts of free licenses aren't for everyone. I expect the SLCC, for instance, would have jumped at a free license early on in this process. Perhaps it would instead have stood its ground on principle, but given the enormous cost in time and money, not to mention that this thing has dragged out now for several years, I doubt it. So nice job, Rose City. While one con fights not just for its life, but for the common sense notion that "comic con" should no longer be considered a legit trademark, you went full Judas. Hope those 30 pieces of silver are worth it. 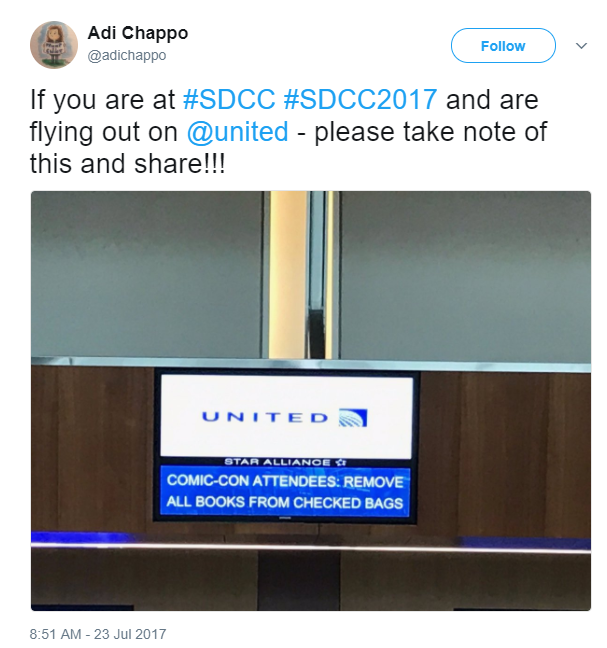 United, being United, responded that the TSA was demanding that all comic books from San Diego Comic Con could only go in carry on luggage. Chappo asked for more detail and United told him to reach out to the TSA directly. So, there was either some sort of bizarre miscommunication between the TSA and United, or it was just United being United. Either way when it comes down to a dispute between the TSA and United, it's difficult to bet on which organization is likely to act worse.